There was no polka band this year. 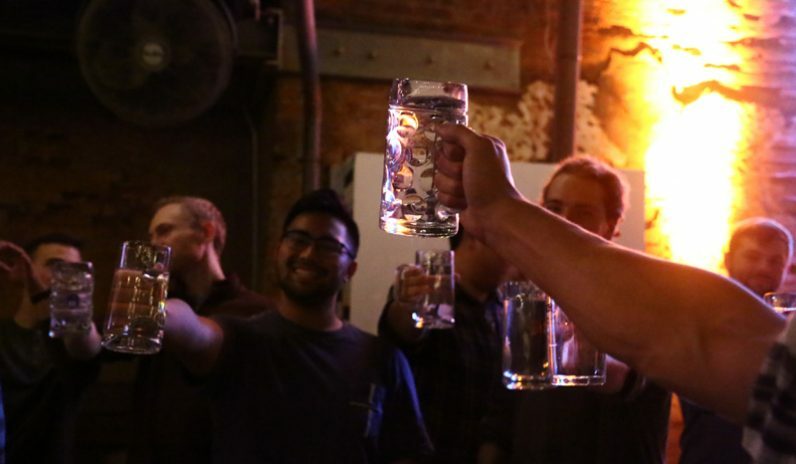 But Anthem still celebrated Oktoberfest. 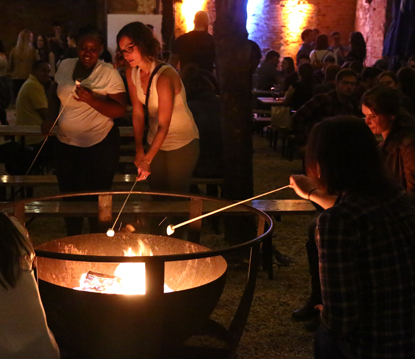 This past Saturday, Oct. 6, Anthem — the rebranded Office of Youth and Young Adults for the Archdiocese of Philadelphia — once more took over Fishtown hotspot Frankford Hall in Philadelphia for its second annual “outreach” event that featured an open bar, marshmallow roasts over open fires in the biergarten, and a stein-holding competition to win Apple Airbuds. But lest you think it was all just beer and sausages, King’s team was out in full-force — and with “merch” to boot. Staff was geared up in newly designed Anthem T-shirts (available to buy on site) and eager to talk about Alpha — the office’s newly adopted program of evangelization and catechesis that would be meeting every Tuesday at Frankford Hall. Alpha is a course on Christianity originally developed in 1977 by Anglican ministers; it has since expanded and is present in over 100 countries to become a course on “mere” Christianity — basic unifying tenets common to most denominations. Individual churches are encouraged to provide follow-up courses of their own to supplement specific doctrine. It is endorsed by such Catholic luminaries as Father Mike Schmitz, who has described it as “one of the best things happening in the church today,” and Cardinals Sean O’Malley and Mark Ouellet. Prior to the reformation of the office in 2016, ministry to youth and young adults fell under the Office for Catechetical Formation, which handles parish RCIA and PREP programs. 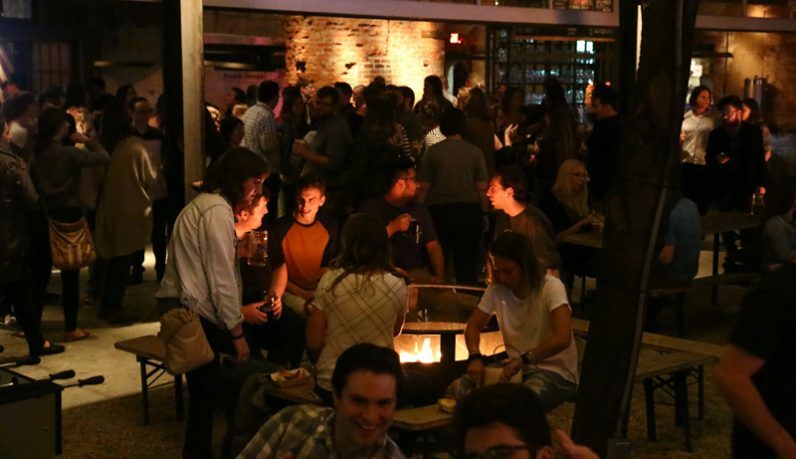 Frankford Hall is a Stephen Starr restaurant at 1210 Frankford Avenue, a traditional, open-air German biergarten that it is extremely popular with Philadelphia-area young adults. Marketing shifted somewhat this year; rather than gearing the event to young adult groups, St. Charles Seminary and parishes, King described the approach as using more word-of-mouth and online outreach, as well as demographics the office had tapped into throughout the year. The result was a crowd with fewer Roman collars than the previous year. Notably absent was Archbishop Charles Chaput, who mingled with the crowds last year and led grace before the meal. This year he was not able to be present due to his attendance in Rome at the 2018 Synod on the Youth. “We’re using it to fill out ‘the funnel’ and maybe get more active leadership in,” said King, “maybe kick off new groups who are more intentional about building communities here in the city. Last year was something of a ‘belong” event. This year it’s about reassessing for the next thing. Ah, booze and religion, a perfect combination! NOT!